New automobiles are reaching dealerships with all manner of sophisticated lifesaving technology, like collision-warning systems and automatic braking. But older cars can be outfitted with similar systems, too, and a study suggests it can make driving safer for you — or your teenager. “This can be a great way to get the safety benefit of crash-avoidance technology at a reduced cost compared to a new car,” said Ian Reagan, the author of the study and an official at the Insurance Institute for Highway Safety, a research group funded by the insurance industry. Such technology could be particularly valuable for teenage drivers because mile after mile, the system would remind the driver of safe practices like using turn signals and not following too closely, Mr. Reagan said. Sixty-two percent of the drivers in the study reported changing the way they drove, including paying more attention to how closely they were following and using their turn signals more often, said Mr. Reagan, who presented the research at an international conference last year. “Based on the objective data, people did change their behavior in a way that suggests that they drove more safely,” he said. The exception was speeding, Mr. Reagan said. Drivers didn’t significantly slow down. The study involved 22 vehicles owned by the institute’s employees — with one auto as old as 1994. They were equipped with an “advanced driver assistance technology system” made by Mobileye, one of the best-known names in this field. It’s a subsidiary of Intel and it sells collision-avoidance systems installed in new vehicles by about two dozen automakers including Ford, General Motors, BMW, Nissan and Volvo. Unlike most of the systems installed on new vehicles, the Mobileye 630 system, for older cars, does not automatically apply the brakes in an emergency. Instead, it’s limited to audio and visual warnings. Those warnings can be triggered by the driver following too closely, speeding or changing lanes without using turn signals, or by a pedestrian in the vehicle’s path or a possible collision with an object ahead. 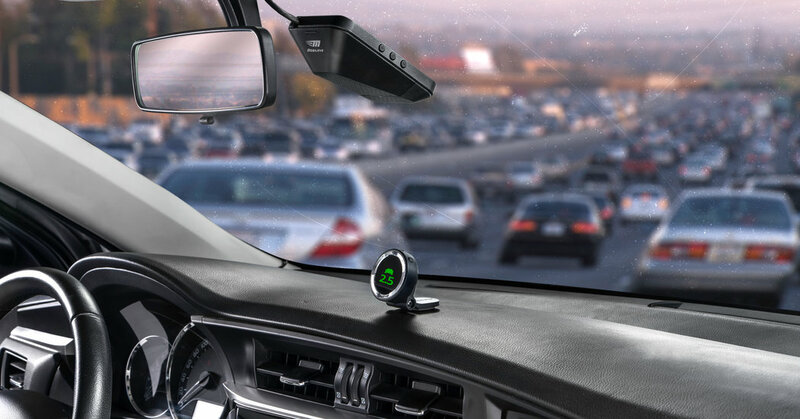 The system uses a camera mounted on the windshield and a display for the driver mounted on the dash. It is hooked into the car’s electronics, so it can monitor information like the use of turn signals. The system’s settings are adjusted to match the vehicle’s model. Normally some of the Mobileye settings can be adjusted to suit a driver’s preferences. For example, the lane-departure warning can be turned off. But during the test none of the settings could be disabled or modified. The systems were tested in both urban and rural settings because the institute has employees at its headquarters in suburban Washington, D.C., as well as its Vehicle Research Center in rural Ruckersville, Va. Things didn’t get off to a good start for Raul Arbelaez, the vice president of the Ruckersville center, who tried it in his 2013 Volkswagen Passat. “I was mostly annoyed at first, quite honestly,” he said. For instance, during his drives along Route 29, a curving four-lane highway, Mr. Arbelaez might cut the corner just a little — if there was no traffic. This behavior did not escape the Mobileye, which scolded him. “It was beeping at me,” he said. Indeed, it bully-beeped him into changing his ways: “I started using my turn signal all the time,” he said. And a few times, the collision-warning system went off when no disaster loomed. “But over all, I thought it was pretty good,” he said. Those who tested the system in an urban setting — around Washington, D.C. — included David Kidd, a research scientist who drives a 2009 Saab 9-3. He regularly heard warnings from the “headway monitoring” feature. It checks whether the driver is so close to the vehicle ahead that in an emergency he couldn’t stop quickly enough to avoid a crash. He never saw himself as tailgating. He figured he followed at a safe distance. The Mobileye had a different viewpoint and warned him again and again to drop back. “That was a big revelation,” Mr. Kidd said. But the urban testers also reported that the headway monitoring could be a nuisance in traffic. Leaving what the Mobileye considered a suitable distance from the vehicle in front meant somebody else could zoom into that gap. And that would set off the warning. The key to gathering information was installing a special system in 15 of the vehicles. During the first month, the Mobileye system was working, but it wasn’t giving the driver warnings. The alert function for the driver was turned off. But it was quietly snitching, reporting every transgression to Mr. Reagan. After the month of silent reporting, the alert function for the driver was turned on. For eight weeks Mr. Reagan compared the number of alerts for every 100 miles driven. He looked at collision warning, lane departure and headway monitoring. When he compared those with the silent period, he found the number of warnings dropped between 30 and 70 percent. Drivers had altered their behavior. One driver reported that the system prevented a crash when he glanced away from the road and traffic ahead suddenly stopped, Mr. Reagan said. Believing that a collision-warning system prevented a crash is not unusual, according to a 2018 study of new cars equipped with the devices, said Kristin Kolodge, an official with J.D. Power, a market research firm. “Fifty-six percent of owners experienced at least one of the advanced driving assistance systems helping them avoid a crash in the first 90 days of ownership,” she said. However, installing the Mobileye in passenger cars and trucks is unusual. In North America, Mobileyes are primarily sold to fleets of trucks, buses and taxis, said Uri Tamir, the company’s senior director for strategic initiatives. Consumers don’t buy many, although he declined to be specific. “But hopefully that will change in the near future as people become more knowledgeable about the benefits of collision-avoidance systems and the fact that they can add it to their vehicle,” he said. He said Mobileye had not actively pursued this market, but that could change. Mobileye dealers sell systems for cars and light trucks for $650 to $850 plus installation, which takes about an hour and is close to “plug and play,” Mr. Tamir said. Buyers shouldn’t expect installing such a system to significantly reduce their insurance rates — if at all, said Alyssa Connolly, the director of market insights for The Zebra, a website that compares auto insurance rates. “Potentially, they might see a few dollars savings,” she said. But they might not. Insurers won’t typically reduce the premium — even on new vehicles — because the sophisticated systems make the vehicle more expensive to repair in a crash, she said. While the 22 testers from the Insurance Institute had some gripes, all but one opted to keep the system. That included Mr. Reagan, who recognized that it was making him a safer driver, too. “I never used turn signals as much until I started driving with a lane-departure warning system,” he said.